Israeli leaders welcomed the U.S. airstrikes in Syria, saying they sent a strong message that the Trump administration would not accept the use of chemical weapons and was a warning to other hostile states, including Iran and North Korea. The Syrian army said a U.S. missile attack on one of its airbases killed six people and caused extensive damage, adding it would respond by continuing its campaign to "crush terrorism" and restore peace and security to all of Syria. Turkey's foreign minister called for Syrian President Bashar al-Assad's immediate removal on Friday, saying a transitional government must be established and voicing support for a U.S. missile strike overnight on one of his air bases. "It is necessary to oust this regime as soon as possible from the leadership of Syria," Foreign Minister Mevlut Cavusoglu told reporters in the southern town of Alanya in comments broadcast live. "If he doesn't want to go, if there is no transition government, and if he continues committing humanitarian crimes, the necessary steps to oust him should be taken," he said. German Chancellor Angela Merkel and French President Francois Hollande spoke about the situation in Syria on Friday and want to continue efforts to hold Syrian President Bashar al-Assad to account for "criminal acts", a statement from Berlin said. Russian state TV said on Friday that U.S. air strikes on a Syrian air base had destroyed nine planes, but had left the main runway relatively unscathed. The Rossiya 24 channel showed footage of the base after it was struck by U.S. cruise missiles. Craters, debris and rubble was visible, but the main runway looked largely intact. It was unclear whether the channel was showing all or just part of the base. Russian state TV shows images of bombed Syrian air base, shows craters and rubble, says runway almost undamaged. Turkish foreign minister says the coalition was informed of the U.S. missile strike, adds that he made efforts to contact Russia's Lavrov and U.S.'s Tillerson. France's Hollande says France and Germany will continue efforts through United Nations to achieve the best response to chemical attacks. Russia wants an emergency meeting of the U.N. Security Council to discuss U.S. missile strikes on Syria, the Russian Foreign Ministry said on Friday, describing the action as "thoughtless". Turkish foreign minister says transition government must be established in Syria, should be without Assad. Turkish foreign minister says the Syrian Government must be removed from office. France's Hollande says the U.S. strikes were what France had been asking for in 2013 after previous chemical attack. Germany's Merkel and France's Hollande call for international community to campaign for political transition in Syria - German government spokesman. The Syrian army said a U.S. missile attack on one of its air bases had killed six people and caused extensive damage, adding that it would respond by continuing its campaign to "crush terrorism" and restore peace and security to all of Syria. Turkish President Tayyip Erdogan's spokesman said on Friday it was necessary to enforce a no-fly zone and create safe zones in Syria without delay, calling U.S. missile strikes against a Syrian air base a positive response to "war crimes". "The destruction of Sharyat airbase marks an important step to ensure that chemical and conventional attacks against the civilian population do not go unpunished," spokesman Ibrahim Kalin said in a written statement. Russia foreign ministry says it is obvious that U.S. strikes prepared before alleged chemical attack in Idlib. Russia foreign ministry says suspends Syria air safety agreement with U.S.
Turkish presidential spokesman says calls urgently for a no fly zone and safe zone in Syria to prevent further massacres. 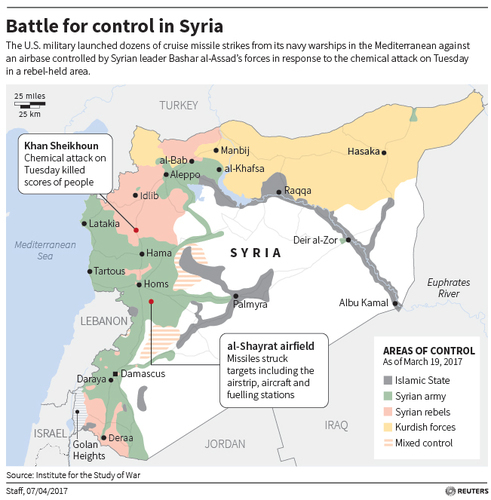 The Syrian opposition welcomed U.S. strikes against a Syrian government airbase on Friday and called for more after two American warships fired dozens of missiles at the airfield in a sharp escalation of the U.S. military role in Syria. A statement from the army command described the attack on Friday as an act of "blatant aggression", saying it had made the United States "a partner" of Islamic State, the Nusra Front and other "terrorist organisations". German foreign minister Gabriel says it is understandable that the U.S. has now attacked the military structures of the Assad regime, adds that it's key that the further efforts for peace will take place in the UN. China's foreign ministry says the latest developments in Syria show how urgent politician settlement is. China foreign ministry says China opposes the use of chemical weapons by any individual, any country for any purpose. 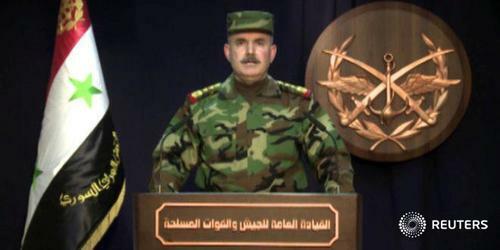 Syrian Army says its response will be to continue to 'crush terrorism' and restore 'peace and security to all Syria' - statement. Syrian Army says U.S. attack killed six and led to big material losses - statement. Syrian rebel official calls for joint international air strikes on all Syrian air bases, Al -Hadath TV says. JUST IN: British Defence Secretary Michael Fallon says he does not see the strike in Syria as the start of a different military campaign. President Donald Trump addresses the United States, saying there is no dispute that Syria had used banned chemical weapons. "Years of previous attempts at changing Assad’s behavior have all failed and failed very dramatically."